Sleeper Coin Report lists rare coins poised to rise strongly in value. 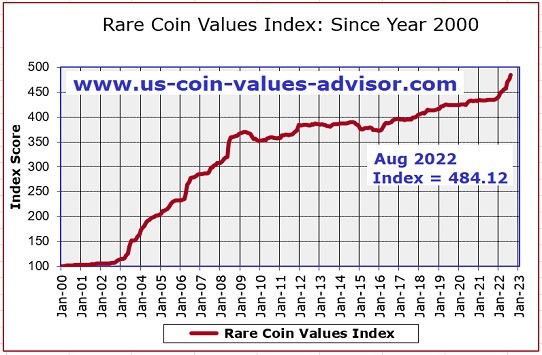 Looking for key date rare coins temporarily sold at discount prices... based on long term value trend data? As many of you may know, "Sleeper coin" is a term used to describe a coin temporarily priced below its true market value, positioned to someday rise significantly in price to properly realign (or establish) itself in relation to its scarcity, relative to demand. Bargain hunt collectors spend their days and nights dreaming of Sleeper coins. To them, happiness is finding a bona fide rare coin at a discounted price, just like the jingle goes... "to a smoker, it's a Kent" [us Baby Boomers get it -- you Gen X'ers and Millennials can click the link or Google it!]. The problem most Sleeper coin seekers run into is how do they know when they've found a coin temporarily depressed in selling price? Without value trend data from the past, the selling price of today cannot be put in historical context. Is it a bargain or not compared to a few years ago? Is this a coin with a long track record of proven popularity with collectors? Is now the time to make a purchase or look for bargains elsewhere? How do I recognize a Key Date that's lost some of its shine, for now? What are the Sleeper Coins in Numismatics Today? Fortunately, thanks to my many years of numismatic value trend research, I have the scoop on elusive Sleeper coins. Because I keep so much data on historical coin value trends, I know how to recognize a Sleeper coin when I see one. That's why I've produced the Sleeper Coin Report. How did I find coins to spotlight in the Sleeper Coin Report? The best way to illustrate how to spot a Sleeper coin nugget is by way of example. Consider the 1875-CC Twenty Cent coin. 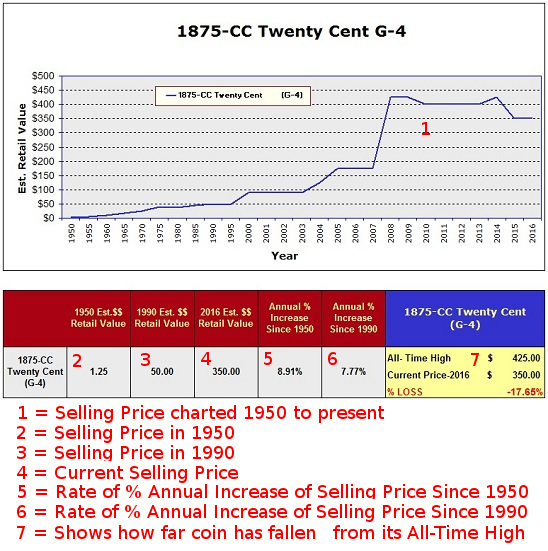 As the above data demonstrates, the 1875-CC Twenty Cent in Good condition was worth $1.25 in 1950. Today, the same coin retails for about $350. That computes to a 8.91% compounded annual rate of increase over a 66 year period, which, as any financial analyst will confirm, is very, very nice. A similar scenario prevails over other lengthy time horizons as well. Let's say you purchased the 1875-CC in Good condition in 1990 for $50.00. To reach its current price tag of $350, it would have to increase at an annualized rate of 7.77%. Pretty darn good! The impressive record is not limited to the Good condition specimen. The same can be said for the 1875-CC across the grade spectrum. For example, the 1875-CC in Extremely Fine condition was valued at about $8.00 in 1950. It's retail value in 2016 of approximately $1100 translates to an annual percentage increase of 7.75%. the 1875-CC Twenty Cent is a favored collectible coin with the numismatic community, due to its veritable scarcity and historical significance. It has a long trail of price hikes to brag about. By comparison, common date coins advance in value at a much slower rate, especially if their precious metals influence is removed from the calculation. For example, the much more common 1875-S Twenty Cent has advanced at an annual rate barely above 3.00% since 1990. As popular as the 1875-CC Twenty Cent has been for a very long time, it has dipped in value considerably in recent years. Between 2008 and 2013, the value of a Good-4 example topped out at $425. The same coin can be purchased in 2016 for around $350, at a discount of almost 20% from its all-time high. The 1875-CC Twenty Cent isn't the only rare United States coin that has lost a little bit of steam lately. On the chart below, the red line in an indicator of the overall health of the U.S. rare coin market since the year 2000. It is an index based on the price movements of 87 representative collectible United States coins, ranging from the half cent to $20 double eagles. After you're done here, we encourage you to read more about the Rare Coin Values Index. In the last 4-5 years, the market has mostly moved sideways (June 2016 update: The Index has been creeping upward this year, but we're certainly not in a bull market for rare coins... yet). Many key date rare coins tracked in the Index have continued their ascent during this time, but the overall market has been stuck in neutral, meaning some key date coins have actually lost some value during this time to counter upward momentum of the positive Index coins. These are the elusive Sleeper coins. For the time being, they're priced below where they should be, a situation that will eventually correct itself. A minimum of 5.0% annual compounded rate of increase from 1990 to 2016. Must have fallen at least 10% in value from its all-time high to 2016. The truth is, virtually every key date United States coin has its ups and downs. Even top collector favorites, such as the 1796 Draped Bust Dime or the 1848 CAL. Quarter Eagle have been known to take a breather. Neither of these numismatic behemoths are in the Sleeper Report, but don't be surpised if someday they show up in a future edition of the report. Okay, who is the "Numbers Freak" that Put The Sleeper Coin Report together? My name is Daniel J. Goevert. I've been a devoted coin collector for nearly 50 years. When other kids were shooting baskets in the driveway, I was at the kitchen table with my #2 pencil, Big Chief tablet and slide rule, creating charts and tables detailing coin price movements. Back in 1985, I started publishing coin value trend data and percentage gain and loss analyses for United States coins. In 2003, I started my website, US Coin Values Advisor, for the purpose of presenting my research online. Since then, I've posted tons of trend data out in cyberspace. A total of 34 Sleeper coins are presented, ranging from one cent to double eagle ($20 face value). The data for each of the 34 Sleeper coins centers around a lower grade (e.g. Good or Very Good), because that's where the base of the hobby is most active. Any coin that is slumbering in a lower grade is most likely bagging ZZZZZ's in the higher grades as well. If you can afford the coin in a higher grade, go for it. Charts, data, and computations for each Sleeper coin for you to study every coin in depth. You'll see some of them are "sleepier" than others. By chance, the Sleeper coins cover a wide spectrum of prices. If your budget is $100 or $100,000, there are bargains within your reach. How is the Sleeper Coin data presented? For each and every coin presented in the Sleeper Coin Report, there is a chart illustrating price movements since 1950, followed up by a table highlighting key data points in the chart, along with an analysis of percentage gain over long periods of time. Of critical importance is a computation showing how far the coin has fallen in value since its All-Time High. Everything in the actual report is shown bigger than the sample below, so you won't have to squint like you're doing now (my apologies, but I couldn't get it to fit here any other way). There are also high quality obverse and reverse coin images. The "Sleeper Coin Report" is Ready for Download Now. You Can Have It In Your Hands In Minutes. The report is configured in PDF file format for clean processing on your home printer. Keep the report on your desk for quick reference or take it to coin shows. The report renders well on mobile devices if that is your preference. A secure shopping cart via PayPal, the leading online transaction processor, is used as the transmitting agent for your safety. Click the "Add to Cart" button below. A Shopping Cart page will open for you. On the Shopping Cart page, click the yellow "Checkout with PayPal" button. You will be given a choice to pay either with your credit card or with a PayPal account. You do not have to have a PayPal account to use your credit card. Upon successful payment you will be sent to a "Thank You" page on this site. Seconds later, you'll receive an email with an E-Junkie link to download the 36 page Sleeper Coin Report. If you don't get the email, be sure to check your spam basket. 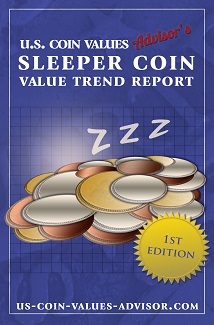 IMHO, the Sleeper Coin Report is worth far more than ten bucks, because it is one of the few tools available to help coin collectors find honest-to-goodness rare coins selling temporarily below their normal levels. A collector could save hundreds, if not thousands of dollars. However, I know from past experience there is a great deal of resistance from buyers toward any type of online report priced above ten dollars, hence, the gimmicky price of $9.95. It is my goal to sell a few reports here and there to justify the enormous effort required to keep this site up and running, so pricing it just below $10 is my best hope. I'm confident you will be happy with this report. However, if it does not meet your expectations, we offer an unconditional, no-questions-asked, 30-Day full refund. P.S. Take advantage of my years of experience and find bargain priced Sleeper Coins. Now comes the obligatory fine print stuff: Because it is always possible to make an errant keystroke or get cross-eyed when crunching data, we have to say this: The content in the Sleeper Coin Report has been researched by US Coin Values Advisor from a variety of sources and is believed to be accurate, and is provided "AS IS", without warranty of any sort, either express or implied. No representation or warranty is given regarding the fullness or correctness of the content. Thus, readers should be cognizant of the possibility that content is less than complete or contains errors. If incorrect content is found, the sole responsibility of US Coin Values Advisor is to remedy the inaccuracy, and will not be subject to additional liability or responsibility.